COHRED provides this page as a service to development and health sector partners. It aims to spark a dialogue between interested health sector players on how to reduce inefficiency and inequity, and encourage effective investment in health sector projects. 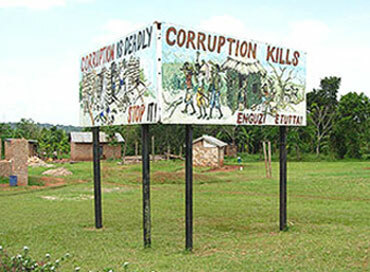 A billboard in Uganda reminds passers-by that misuse of public and donor funds for local, regional and national health projects is no benign affair. It has a direct – negative – impact on the lives of people in communities. The currently accepted practice of ‘sitting money’ – payment for attending meetings – was not intended to cause harm, but it is has become so widespread that it reduces the effectiveness of health and development programmes in many countries.If a Minister of Health first needs to consult a donor – for example, so that her institutional director can attend health research policy development workshop – then it is defacto that the donor, not the Health Ministry, that controls the policy making. Sitting money paid to meeting participants as a per-diem allowance or ‘attendance fee’ is an accepted practice in many countries and most of Africa. It has resulted in situations where many officials and experts will not attend a meeting on vital health topics unless they receive payment. Uninformed commentators place the blame for this practice on African partners. This is incorrect. Sitting money was created by donors to ensure attendance at project and programme meetings so that they can achieve their goals. In this case, those who pay the most get the highest attendance. COHRED does not pay sitting allowances or make other indirect payments to individuals for attending meetings on matters of national interest. Other development organisations are encouraged to do the same. Donors are encouraged to provide direct budget and salary support to country agencies and organizations to create a base of locally competitive staff positions. COHRED offers to work with development partners and developing countries to advocate for direct salary support to find researchers and professionals in ministries. People holding Key positions in ministries need improved salary levels. COHRED commissions work for which locally competitive honoraria are paid.